Author(s): Bill (Brent), Dermott (Nancy), and Shapiro (Tim). Subject(s): Church, Church expansion, and Renovation. Building communicate. Stained glass windows, high altars, multi-purpose worship/gymnasium spaces, Plexiglas pulpits, padded pews–these and all other architectural elements say something about a congregation’s theology and mission. They point to a faith community’s beliefs about worship, identity, purpose, and more. From the stark simplicity of a Quaker meetinghouse to the splendor of a Romanesque Revival building, sacred spaces speak loudly. What they say can either reinforce a congregation’s mission or detract from it. 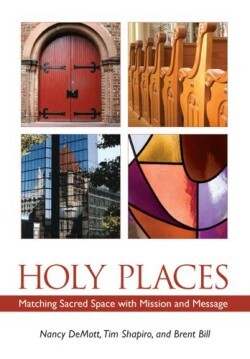 Holy Places is designed to be used by congregations who are involved in or are contemplating work on their facilities. This could include renovation, remodeling, expansion, or building. No matter how extensive the project, approaching the work with mission at the forefront is the key to having a final result that strengthens the congregation’s ministry. The process outlined in this book–discern, decide, do–lets congregations begin where they are and provides the help they need to move to the next level.